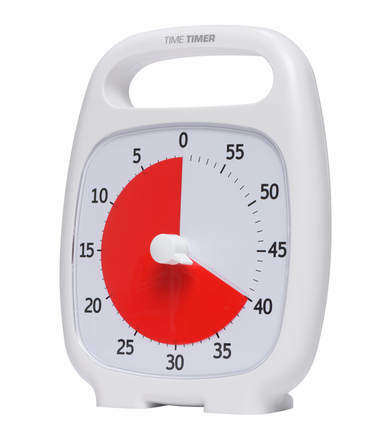 How to redesign the Time Timer after 15 years of success? For the PLUS, we added an on-the-go handle to make it easy, even fun, for schoolchildren to take it from one work group to the next! With a new center knob and a durable clear lens to protect its disk from damage, the PLUS gives kids a sense of independence, freeing teachers from having to monitor behavior and instead allowing them to teach. By showing “how much longer,” the PLUS reduces the stress of transitions - a powerful tool for anyone who struggles with time.